The Persona C16 delivers personalized cards with simplicity. Just plug in and print out! The Persona C16 delivers personalized cards with simplicity. Just plug in and print out! It's as easy to use as a regular office printer. Drop-in ribbon and card loading make it easy to refill. 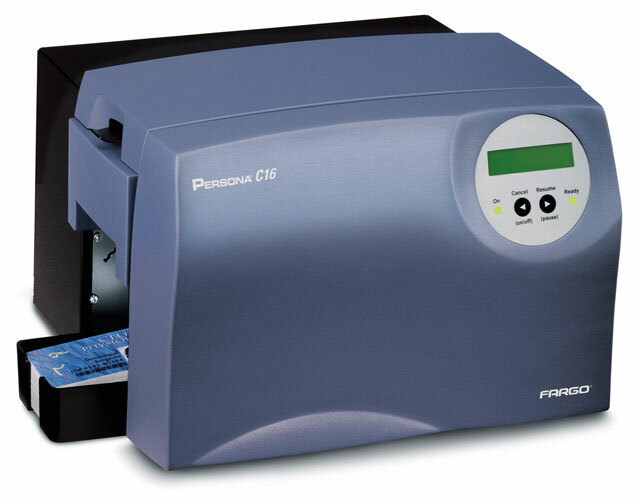 For added efficiency, the Persona C16 has an increased input hopper capacity of 100 cards. It also features an easy-to-read LCD display that shows printer status and other helpful messages. 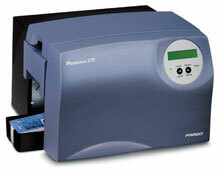 Thermal transfer, 300 dpi, full color printing, up to 720 cards per hour, parallel interface, 2MB RAM. Includes LCD display, low coercivity magnetic stripe encoder & power cord. Order cables separately. See accessories. Thermal transfer, 300 dpi, full color printing, up to 720 cards per hour, parallel interface, 2MB RAM. Includes LCD display & power cord. Order cables separately. See accessories. YMCKO Cartridge W/Cleaning Roller, Full-Color Ribbon With Resin Black And Clear Overlay Panel for C30E Printers, 250 Images Per Ribbon, Single Ribbon.